A front porch can work wonders for the appearance of your home. By giving you more space, they’re also a fabulous way of boosting your kerb appeal. However, to bring out the best in your porch, use your beautiful front garden and plants to bring it to life. If you don’t have a lot of space surrounding your porch, hanging plants could be an ideal way to add some colour to your home. Choose from baskets or balls to spruce up your home. Petunias and geraniums are a great choice and come in bright pinks and purples to add a splash of something different. If you don’t want the hassle of looking after these, you can get artificial hanging plants that look indistinguishable from the real thing. Experiment with sizes and colours to create an attractive display that will attract wildlife as well as improve your garden. You can get so many types of pots from brightly coloured glazed ones to patterned stone to give your garden an exotic feel. Conifers are beautiful all-year round plants for pots that provide an inviting welcome every time you come home. Having one on either side of your door will add a touch of symmetry to your home. Topiary plants can come in various shapes including spirals and balls as well as elaborate designs like hearts and swans. A porch is the ideal place for climbing plants such as ivy or honeysuckle to thrive. These create a natural frame around your porch which can add a charming cottage feel to any home. Even if you’re in the middle of the city you can still have a slice of the countryside. How about a mini garden? Take a collection of shrubs, plants and flowers to create your own garden in a pot. You could even coordinate the colours with the rest of your home. Did you know our windows come in any RAL colour so you could match bright plants with your new wonderfully coloured windows? We can create stunning porches for your home with a choice of brick, aluminium or uPVC and as much or as little glazing as you want. Choose from a flat, tiled or glass roof as well as a wide range of secure and attractive doors. Our porches are made from the same high-quality materials we use for your windows so you can be assured that they will keep your home comfortable and secure. The ideal place to store shoes, they also make the front or back of your home stand out from the rest. 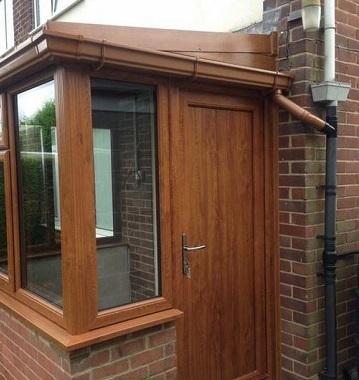 Get in touch today to find out about adding a beautiful porch to your home. This entry was posted in Homeowner guides.